I am not going to lie to you—my grilling skills are fairly nonexistent. Blame it on a lack of experience. Still, I harbor dreams of summers spent throwing everything on the grill, from peaches to pork chops, sardines to salad greens. 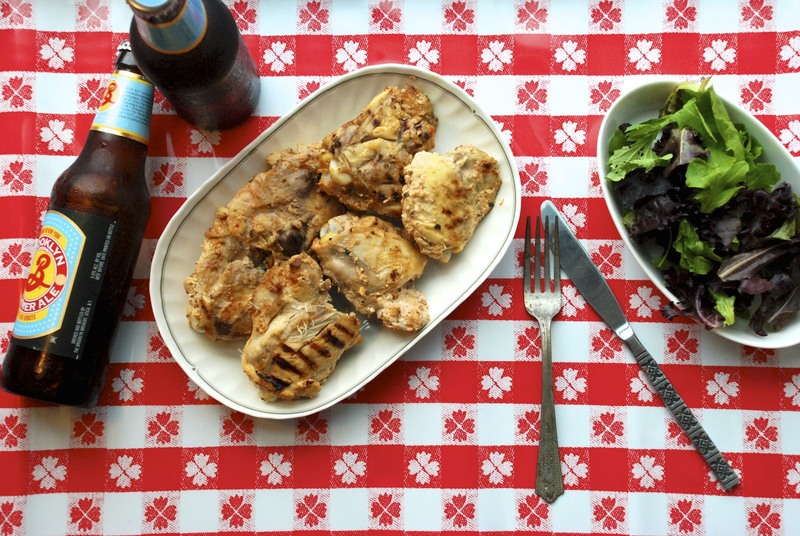 Because let’s face it—grilling is cool. It requires knowledge of fire, how to build it and how to control it. A man (or woman) wielding tongs, intuitively determining when that rainbow trout is perfectly done—crispy on the outside and succulent on the inside—is impressive. Fortunately for me, I have a few friends who know what they’re doing, and during a recent catch-up weekend my grilling fantasies were entertained at nearly every meal. For two days, my responsibilities were limited to languorous stretches in the pool, lengthy al fresco repasts and short trots to the fridge for another cold one. Not bad at all. Indian Style: I pick up a tandoori chicken spice mix from the Indian supermarket, which includes: coriander, chilies, cumin, turmeric, fenugreek leaves, salt, black pepper, dry ginger, ground mustard, bay leaf, pulse, cloves, nutmeg, caraway, cinnamon, cardamom seeds, mace and asafetida. Mix the spices with fresh lemon juice and plain yogurt, then marinate for 12 hours. Grill the chicken, or bake at 350°F for 20-30 minutes before 5 minutes under the broiler, to achieve a crispy skin. Greek Style: Combine powdered garlic, thyme, turmeric, black pepper, sea salt, mustard seed, bay leaf, dill weed, oregano, coriander, ginger and a touch of sugar. (The Whole Foods Mediterranean spice blend is pretty spot on). Mix the spices with fresh lemon juice and plain yogurt, then marinate for 12 hours. Grill the chicken, or bake at 350°F for 20-30 minutes before 5 minutes under the broiler, to achieve a crispy skin. She noted that, “any mix of dried herbs with a yogurt/lemon base is going to be pretty incredible.” How right she is. My version utilizes the dried spices I keep at home, and you can do the same. I also added mine in uniform quantity, but if you have a particular affinity for one spice or another, feel free to add extra. Happy grilling, indoors or out! Remove skin and excess fat from the chicken thighs. Generously sprinkle both sides with sea salt and pepper, and then move to a casserole dish. Measure yogurt and juice lemon, then combine with chicken in casserole. Make your spice mixture in a separate small bowl, and then add to casserole dish. With your hands, toss all ingredients until the yogurt, lemon juice and spices are totally incorporated. Yogurt mix should cover the chicken completely. Seal with plastic wrap, and let chicken marinate in the refrigerator for 12 hours. Heat a heavy grill pan (mine is cast iron) on medium-high heat for 10 minutes. In batches, cook chicken for about 12 minutes on each side, 25 minutes total. (Adjust based on the thickness of your chicken). Serve with your favorite summer side dishes.